Varalakshmi Puja is observed by married women in Tamil Nadu, Karnataka, Telangana, Andhra Pradesh, Maharashtra and other parts of South India. Varamahalakshmi Festival date is based on Hindu calendar and panchang time in India. Varalakshmi Puja 2019 date is August 9. Goddess Lakshmi – the goddess of wealth and prosperity – is worshipped on the day. 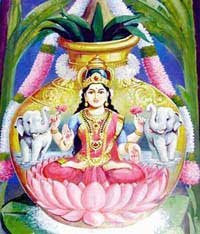 Varamahalakshmi literally means the boon granting goddess. Worshipping Goddess Lakshmi on Varalakshmi Vrata day is equivalent to worshipping Ashtalaksmi – the eight goddesses of Wealth, Earth, Learning, Love, Fame, Peace, Pleasure, and Strength. The importance of Varalakshmi Puja is mentioned in the Skanda Purana. It is believed that importance of Varalakshmi Puja was narrated to Goddess Parvati by Lord Shiva. Goddess Parvati wanted to know about a Vrata that is highly beneficial to a woman, which will help her lead a happy and prosperous life on earth. Lord Shiva then mentioned about the Varamahalakshmi Vratam. How to do Varalakshmi Puja? What to do with Water and Coconut atop Kalasham after Varalakshmi Puja?